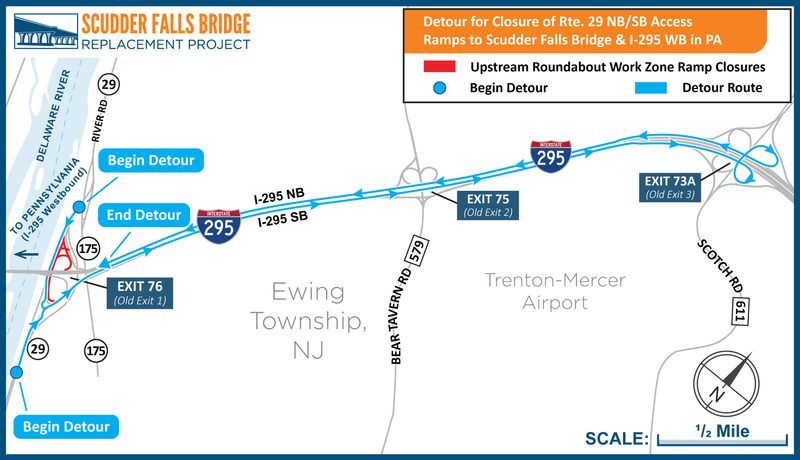 A project to alleviate traffic congestion and upgrade safety and operational conditions on the Scudder Falls Bridge and adjoining highway segments. 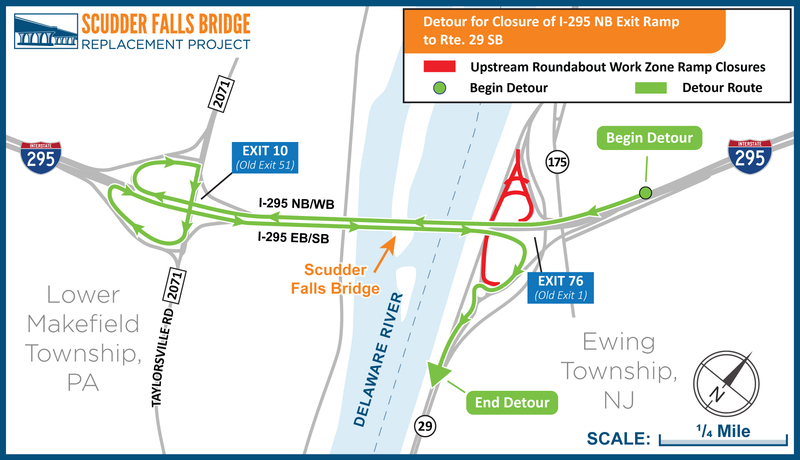 This will largely affect Pennsylvania motorists who cross into New Jersey on the Scudder Falls Bridge and then attempt to use the first exit for connection with Route 29 northbound toward Washington Crossing and Lambertville. Ramp closure is scheduled to begin 4 a.m. Monday, Feb. 18, and remain in place 24/7 for 18 consecutive weeks until June 24. 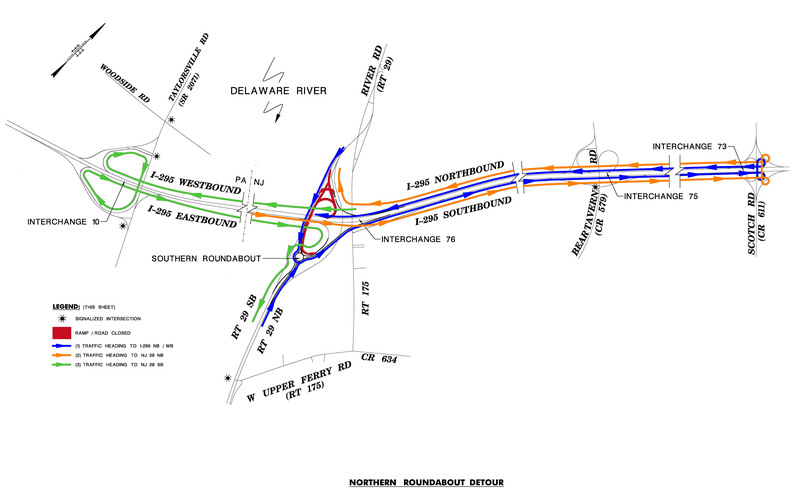 This will largely affect motorists from Ewing and Trenton to the south and Hopewell and Lambertville to the north who use this interchange for connection with I-295 and the Scudder Falls Bridge for travel into Pennsylvania toward Philadelphia. 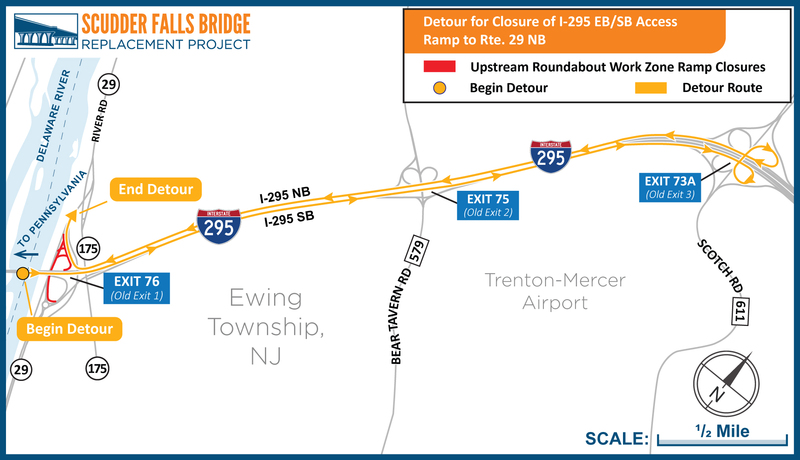 This detour largely affects motorists/job commuters from Princeton/Lawrenceville area who take I-295 NB toward the Scudder Falls Bridge and use the last New Jersey exit for connection with Route 29 SB toward Trenton. 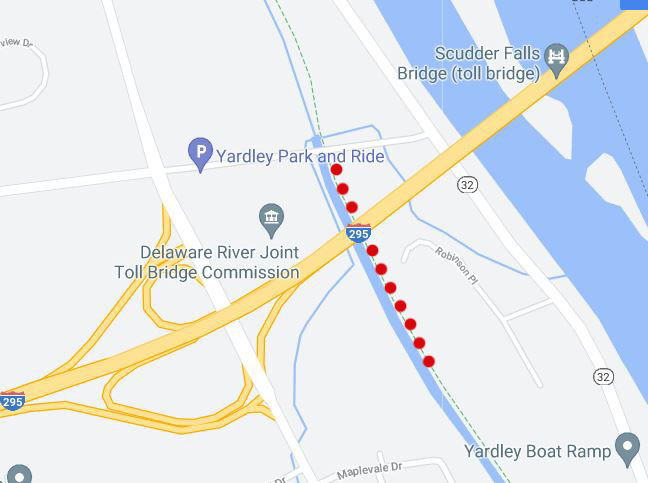 A portion of the Delaware Canal towpath in the vicinity of I-295 (old I-95) on the Pennsylvania side of the Scudder Falls Bridge is expected to have occasional short-notice weekday closures until June 2019. The closures are needed to ensure public safety as work crews construct a new, widened approach bridge to carry I-295 across the canal. Barring any schedule changes, the towpath is expected to be open to public use on weekends. Revised on March 22: Intermittent daytime and nightime closures of the Delaware & Raritan Canal towpath on the New Jersey side of the Scudder Falls Bridge are now scheduled to continue through April 2019. 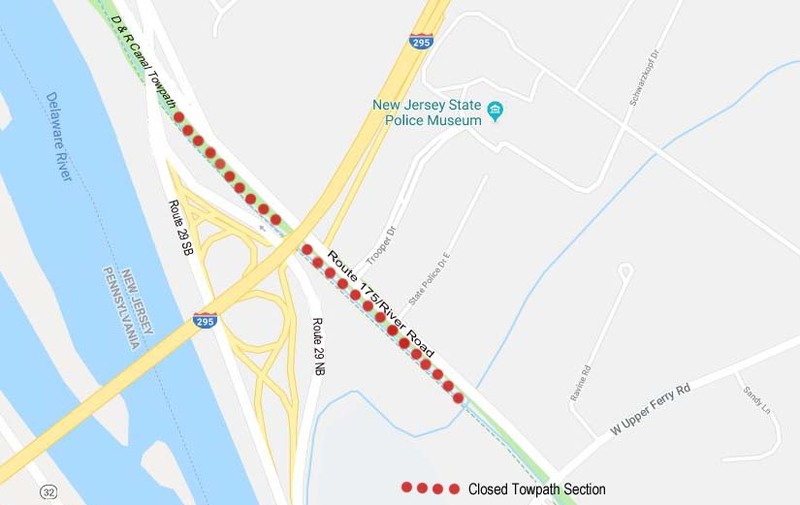 The closures are needed to ensure public safety while demolition and construction activities take place relative to widening of the I-295 approach bridge that crosses over NJ Route 29 NB, NJ Route 175/River Road, and the canal. Towpath closures may occur during weekends, although Sunday closures are very unlikely. Subscribe to Periodic Project Updates! Get the latest project news, events, and travel advisories right in your inbox.